Our project of “Long-term care prevention using IoT (KAKEN B, 2017-2019)” is trying to incorporate art into health care. In collaborative research with Professor Tatsumi of the Kyoto City University of Arts, participants themselves decorate beacons that record behavior logs and collect original stamps installed in the facility. We hope that art links health promotion and enjoyment of life. 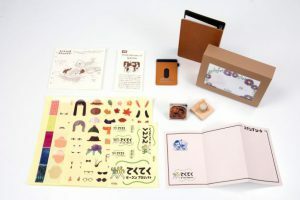 The photo is an example of a product designed by Professor Tatsumi et al.